The Zabi Demesne is ruled by House Zabi in King Dragor's name. A pair of duchies long steeped in conflict but looking towards a brighter, richer future the Zabi Demesne provides many opportunities for warriors and merchants alike. The Duchy encourages the participation of all levels of society in politics, law making and the creation of wealth. The Zabi Demesne seeks to become the sword that King Dragor wields against his foes. As a two border duchies we seek to protect the realm from all aggressors, and should it become needful to exact a bloody price from any who seek to oppose our King's righteous fury. We also seek to maintain a high standard of living for all those within our Demesne who support our martial efforts without necessarily fighting. For this reason the Demesne seeks to encourage economic growth rather than harsh taxation in order to provide the tax base required for a strong military. As such we have several opportunities for both the commercially and martially minded within our Demesne. House Zabi arrived on the borders Kingdom of Nirath some two hundred years after the original nomads began to settle. As the Kingdom began to expand the horse nomads of what is now the Zabi Demesne raided and engaged in low-level warfare with the Kingdom. As the raids increased with each generation so did the cross-trade in culture and technology leading to the eventual assimilation into the Kingdom under the under the rule of a local warlord Dozle Zabi, a man famous for conducting surprise front-line inspections that inevitably turned into raids on enemy territories. Dozle and his descendants aggressively expanded their lands eventually conquering the majority of what is now the Zabi Demesne by Year 550 of the Fourth Age. One hundred years later during the final expansion of the Demesne following the fall of Zygethia. Lord Garma Zabi, in order to reward the faithful servants of the Zabi family the Seldons, gave his second son to be married into the Seldon family and to take their name granting his descendants rule over the Duchy of Iyandolin. This move was contentious and displeased many of the Barons and Mayors of the Demesne some of whom rebelled. These rebellions merged a generation later into a conflict regarding primacy between the Zabi and Seldon families. The conflict was eventually won in Year 740 of the Fourth Age by Lord Sasro Zabi “The Unifier.” Seeing the devastation wrought by the civil war Sasro determined to prevent such a thing from happening again instituting the Curia and firmly cemented his descendants as the grand ducal rulers of the Zabi Demesne. In recent years House Zabi has focused on weapons and armour production and has recently begun hiring out its armed forces to other organisations. The Demesne is controlled by the two families of House Zabi, the main family Zabi and the branch family Seldon. The Grand Duke comes from one of the two families and the senior members of the House vote between them as to which heir will eventually take up the role of Grand Duke. 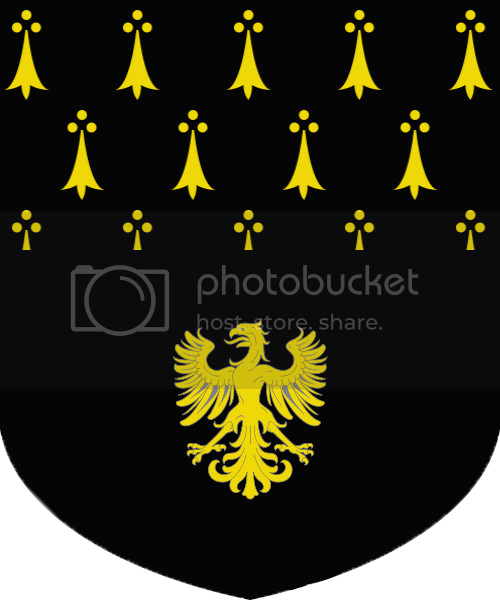 While each Duke within the Demesne is responsible for the governance of his duchy the ruler of the Demesne is responsible for the Demesne as a whole. The current Grand Duke of the Zabi Demesne is Lord Degwin Zabi ((chipla)). The Dukes are assisted in their governance by the Curia, a partially elected body of advisers that has the right to propose changes in the legislation of the Demesne and to help guide the Counts in the formation of infrastructure within the counties of the Zabi Demesne. The Curia consists of three groups, the Counts, the Barons and the Tithings. The Counts as the administrators of their counties are automatically considered full members of the Curia. The role of the Counts is to look after the economic, infrastructural and social growth of the Demesne as a whole, and the advancement of their counties in particular. The Barons as defenders of the Demesne and representatives of the military are automatically considered full members of the Curia. The role of the Barons is to look after the safety and security of the Demesne as a whole, and of the areas around their stronghold in particular. The Tithings are the representatives of the towns in the Zabi Demesne and every settlement that has a town hall and a town charter can send the town mayor to the Curia. Once the town reaches one hundred townsfolk (this includes NPCs) the town may elect an additional representative (on the same cycle as the Town Mayor) to send to the Curia. A third representative is added at 150 townsfolk with an additional representative every 50 townsfolk thereafter. All of the representatives from a town are referred to as that town’s Tithing. The duty of a town’s Tithing is to represent the interests of that town and its citizens to the Curia and to the Demesne as a whole. The Mayor of the town acts as the senior representative. If a member of a Tithing is appointed as a Reeve a new member must be selected by the town. The Council is the body of governance empowered by the House Zabi to assist the Dukes in fulfilling administrative functions. Each Council member has a specific duty or set of duties. Council members are appointed by the Dukes from both the Curia and the general populace of the Demesne and are divided into three types Counts, Reeves and Officers. Unlike members of the Curia members of the Council (excepting the Counts) are paid a wage by the Duke to allow them to focus entirely upon their duties. Counts may be appointed for their lifetime (or until they abdicate) to certain positions within the Council. The High Sheriff is responsible for the judiciary of the grand duchy. It is his duty to oversee the recruitment (and salaries) of magistrates and to maintain the legal integrity of trials within the Demesne. If either Duke is incapacitated or unable to rule effectively for a period of time he may appoint one of the Counts as Lord Regent for a set period of time. During this set period the Lord Regent has the same powers as the Duke. Reeves are members of the Council appointed from the Curia who serve for a 15 year ((two RL month)) term. The Reeve of the Curia acts as moderator for the Curia, ensuring that standards are adhered to and that protocol is observed at all times. The Reeve of the Curia is responsible for tallying votes within the Curia and for reporting the Curia’s advice to the Counts and the Dukes in the rare occasions that they cannot attend. The Reeve of the Curia is also responsible for maintaining the heralds of the Demesne and is allocated a budget with which to do so. The Reeve of Excise is responsible for the collection of tax within the Demesne to be allocated by the Dukes. The Reeve of Excise is given a budget with which to hire tax collectors. The Reeve of Yields is responsible for assessing the resources of the Demesne and for maintaining the Curia and Council’s maps of the duchy and beyond. The Reeve of Yields has the further duty of representing the craftspeople of the Demesne to the Council. Officers are members of the Council appointed from the general populace they serve indefinitely at the Counts’ pleasure. The Officer of Festivals is responsible for encouraging artwork, music, writing and high craftsmanship to flourish throughout the Demesne. The Officer for Festivals is also responsible for the smooth running of several Zabi festivals held at important times throughout the ((RL Year)) and is given a budget to ensure this. The Dukes are the rulers of the Zabi Demesne and are responsible for setting the laws of the Demesne so that they do not conflict with the King's Law and for encouraging the growth, security and quality of life of all those who live within the Demesne. Each of the Dukes is broadly responsible for their own duchies though the Grand Duke looks out for the Demesne as a whole. The Dukes tax the Counts who then in turn tax the residents of their counties, this tax pays for infrastructural improvements, public works, and military security through the funding of Barons and Captains. The Regular Forces of House Zabi are based on the regimental system and is made up of semi independent groups each with its own 'Captain' operating under the command of the Dukes. The budget for the Regular Forces comes out of the purse of the Demesne and the Grand Duke. The Regular Forces of the Zabi Demesne use a modified form of the Nirathii National Structure. Our forces are divided into two legions, 3rd Legion (Gloria Domini) and the 6th Legion (Victrix). 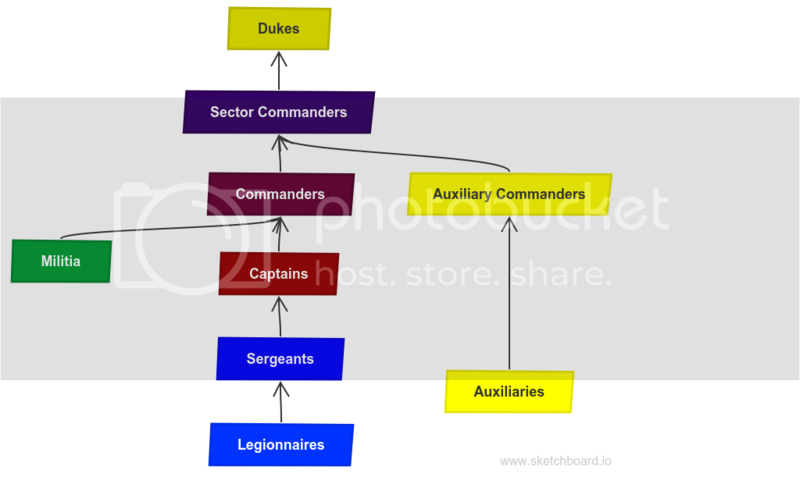 Each legion is roughly responsible for operations within each of the duchies. The legions are directly under the command of the Dukes. Each legion has between two and four Sector Commanders who are responsible for a group of counties called a Sector each command between two and four Commanders. Commanders are generally responsible for one or two counties and command between two and eight Captains. Captains command regiments which are the primary building block of the Regular forces. Each Captain has free reign to decide the focus and structure of their regiment as long as they have Sergeants as mandated in the Nirathii National Structure. Specialists such as medical personnel, engineers and artillerists come under a separate centralised structure including a robust training course at our Zabi Academy of Military Arts. Our structure and the way it interacts with the various county and town militias is highlighted in the image below. Those who wish to become Captains within the Zabi Demesne must petition either Duke who if they desire will award a contract (termed a commission hereafter) detailing the number of troops required, certain duties that must be attended too (such as patrolling roads or garrisoning a town) and the budget given. The budget usually consists of an initial starting capital and monthly wages for maintaining a certain number of soldiers (as defined by the commision.) Captains may sell their military services to other organisations with the permission of the Dukes. While Captains are expected to train their own forces and have the freedom to promote and to enforce discipline within their own ranks, certain standards must be adhered to or the Captain may find themselves looking for new work. The same may be said of equipment, though once the minimum standard is reached the House does not care about variations (meaning rich Captains may equip their troops to higher standards if they so wish). To assist with maintaining standards the Dukes may appoint Inspectors to ensure that the public purse is well spent. The Regular Forces have multiple entry points. The most common route is for a prospective recruit to contact the regiment of his choice and enlist as a legionnaire, this route allows the new entrant to learn the basics of warfare within the regiment he will fight for. Those who are members of a knightly order or who have graduated the knight's course at the Zabi Academy of Military Arts may start at the rank of sergeant in any regular force regiment. Mayors who enter into a baronial contract to become Barons will be considered Captains of their own regiments. Senior officers of independent mercenary units and large warbands who wish to formalise their relationship with the Zabi Demesne may join the Regular Forces as Captains. Counts who enter into a baronial contract will be considered to have the rank of Commander within the Regular Forces. The Militia consists of the household forces of the nobility and any forces raised and paid for on a local level by towns and counties. These forces may come under the command of the Dukes during times of emergency but otherwise are completely independent of their control. The Dukes have founded an academy to teach military engineering and combat medicine. Several of the educational programs are free to those willing to join the Zabi Legions for four years (one RL month) after graduation. Anyone willing to obey the laws of the land may seek residence in any of the counties that make up the Zabi Demesne. In particular, those seeking to found towns, or to become skilled craftsmen are encouraged with some bonuses for each, including assistance with land purchases and infrastructure. Join us in our discord for more information. Those looking to be considered Captains should contact either Duke Hari Seldon or the Grand Duke Lord Degwin Zabi (chipla) who will assess what skills, numbers, and other benefits each potential Captain brings to the role before deciding how to allocate their budget. Those who have backed at Baron level and who wish to set up strongholds within the Duchy may do so and automatically be considered Captains once their contract is agreed. Those who wish to become officers or other ranks within individual regiments are advised to contact the Captains of the regiments that interest them as listed below. We are not actively seeking members for either the Zabi or Seldon families, however those wishing to join either family are more welcome to talk to the leaders of those families. More information will be added to this area as the game goes live. The County of Munzo is the Duke's own county and contains the duchy capital of Partetribus. The capital is currently offering tax relief for craftsmen interested in taking up trades beneficial to the growth of the Demesne, including all forms of smithing, carpentry, masonry, cartography and architecture. We are also offering access to DE and EP patterns to armour and weapons smiths willing to assist in the equipping of the Ducal Legions. The County is also actively recruiting those who wish to boost the urban population by becoming Mayors or townsmen. The County of Iyandolin is the seat of the Seldon family. The Lord Seldon is not currently actively seeking vassals but offers the same reliefs for craftsmen as Lord Degwin. The individual Captains and Regiments will be listed here in order that those wishing to embark on martial careers may find who they wish to serve under. The lead regiment of the 3rd Legion, the 1st Regiment is the Ducal Guard for Munzo and the personal regiment of Duke Degwin Zabi. The lead regiment of the 6th Legion, the Wardens of the Purse are the Ducal Guard for Iyandolin and the personal regiment of Duke Hari Seldon. edits made to the military section. Also major edits made to the 'History' section in order to fit the unified Nirathi lore.